Pairing – Like other programmers of my particular skill level (pisspoor), I get very self-conscious whenever I’m pairing. Not only when I’m the one driving, but also when I’m observing, because I ask stooooopid questions. 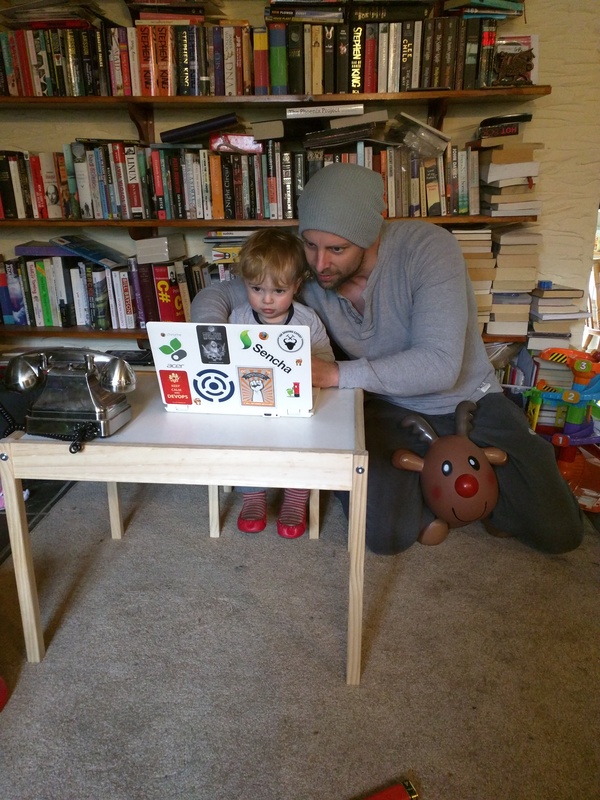 Below is a picture of me pair programming with my son, who, despite being unable to speak yet, is clearly getting annoyed at my stupid questions (I think I just asked him what nested ternary operators are). However, there’s no denying it’s a fantastic way of learning. The technique we’re trying below involves me writing some ruby function, and then my son will refactor it and embarrass me. Retrospectives are a way of reflecting on your latest sprint or release, and talking about what you did well, as well as what you didn’t do so well. The trouble is though, that you have to actually take these lessons on-board, and start implementing changes if necessary. It’s all very well reflecting on your performance, but it won’t improve unless you actually do something about it. This could be a whole blog post of its own, bust basically I’m seeing a lot of people in this situation where they rigorously do retrospectives, but nobody every implements the lessons learnt. Quite often it’s because there’s no agile coach involved with the team (and without the agile coach, nobody else has the time to implement the relevant changes themselves, let alone feels responsible for doing so). Mobbing – Another picture coming up. This time another member of my family is joining in a mobbing session, which is basically a bunch of people all working on the same problem simultaneously (usually around the same screen). Like pairing, it’s a great learning technique. In fact I think it’s superior to pairing, because there are more people and therefore more minds on the job. But of course it can be costly to tie up multiple people on the same task. 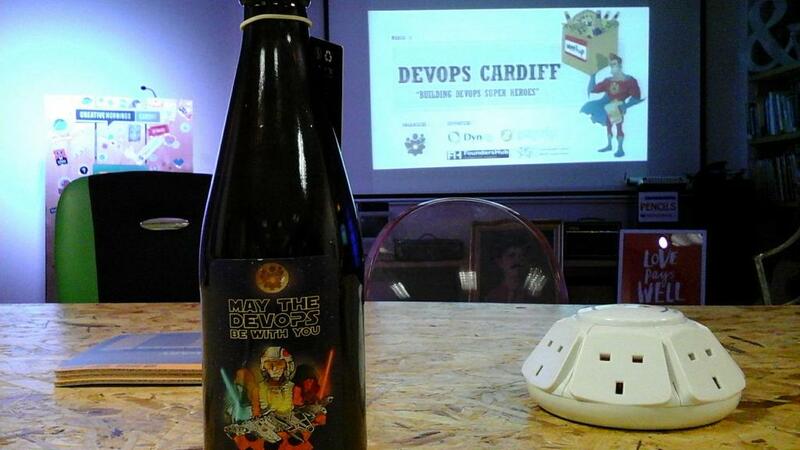 Hackdays are like a geek-off for devs. I once spent the first 4.5 hours of a hackday trying to install LAMP before basically throwing my PC out of a window. Hackdays are where you get a bunch of devs together and give them all a problem to solve, or some objective to reach (you can be a specific or as vague as you like – often the more vague you are, the more creative your devs will be). 24hrs and a lot of pizza later, you’ll have a bunch of interesting creations – some more complete than others, but all of them creative, geeky, and in their own way very cool. I guarantee you’ll never see a passionate software developer work harder than during a hackday. What do you learn from a hackday? As a dev, you learn how to concentrate after 8 cans of Red Bull, and if you’re in a team then you learn how to work as a team under a high-pressure environment. Devdays are something I really like to encourage within my teams. The idea is that for at least one day a sprint, 1 or 2 of your delivery team can work on something outside of the sprint commitments. I would aim to make sure everyone gets to take a devday at least once every 3 sprints. Of course, it needs to be relevant work, and it needs to be scheduled ahead of time (get into the habit of asking if anyone’s planning on taking a devday during sprint planning). If your team aren’t doing devdays, it’s a sure sign that you’re either too busy (and will end up experiencing burn-out) or your devs are disinterested. Devdays are a great opportunity to learn a new tool or to start spiking a new idea, perhaps using a new language. 20% Time is fairly similar to the devdays concept, in that people are encouraged to spend up to 1 day a week working on something that’s not on the backlog. I think the idea came from Google, but I’m not sure if they still practice it. Basically devdays, gold-card days or 20% time, call it what you will, are all designed to encourage learning and innovation and keep people feeling fresh and engaged. During her talk, Rachel spoke a little about Gold Cards, which I’d love to tell you more about, but I had to go and take a call just as she was talking about them, so you’ll just have to go and read more about them here. Tech Talks are like little mini meetups, usually within an organisation, but companies like Facebook also do public tech-talks as well. Great for learning and eating free pizza and doughnuts. As a general rule, if there are no free nibbles, don’t go. Facebook had exceptionally good nibbles at their tech-talk. Just like at meetups, they’re a great place for tapping into the brain power of your fellow attendees as well as the speaker/presenter. Book Clubs are one of the most underrated and under-used tools for learning, in my opinion. I ran a book club last year in an organisation that was trying to transition to Agile. 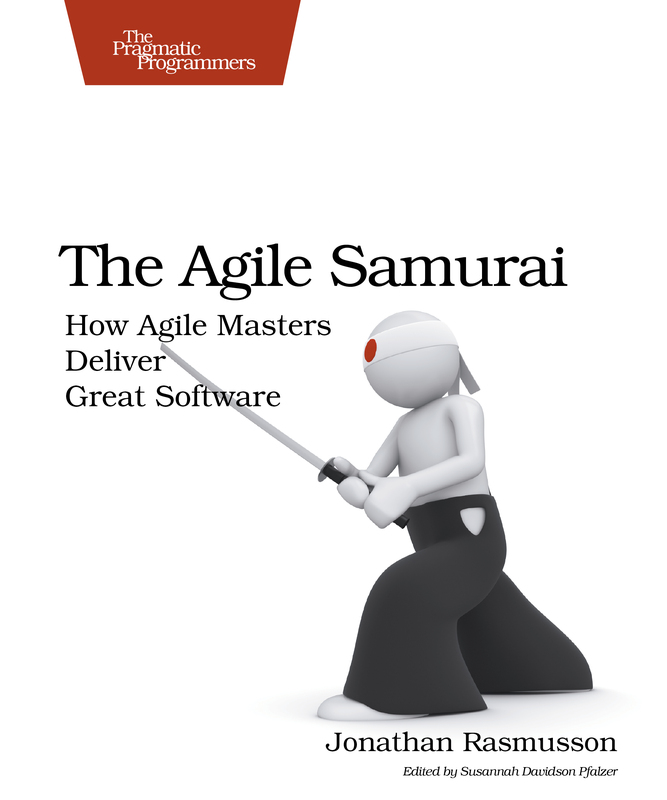 The book I chose was called The Agile Samurai by Jonathan Rasmusson, which was a big hit with everyone who joined in. The format I use is for the group to read a couple of chapters of a book over the course of a week, and then have a review session where we all discuss what we’ve learnt. It’s a great way to share what we’ve learnt (which helps to make sure we’re all on the same page) and it also ensures that everyone is progressing at a reasonable pace. Coding Dojos – These are coding-centric programming clubs, basically. They involve a bunch of eager coders getting together and working (usually on their own laptops or in pairs) on a particular challenge, with the purpose of learning more about a particular language (Ruby, Go, Erlang etc) or technique (BDD, TDD etc). Suffice to say you usually need to have a reasonable amount of programming experience to be able to get the most value out of these, but don’t let that put you off. There are plenty of coding dojo metups available to cater for most levels, or you could of course run one yourself within your own organisation. Team Swaps are where one team swaps with another for an entire day, or possibly longer. The idea behind this is that if you’re going to hand your codebase over to an entirely different team (and not be around to help), then it teaches you to write clean, self-documenting, simple code. On top of that, it also helps you learn more about other team’s coding styles and techniques. Rotation – If I had to pick one concept and make it a mandatory part of software development, I would pick rotation. 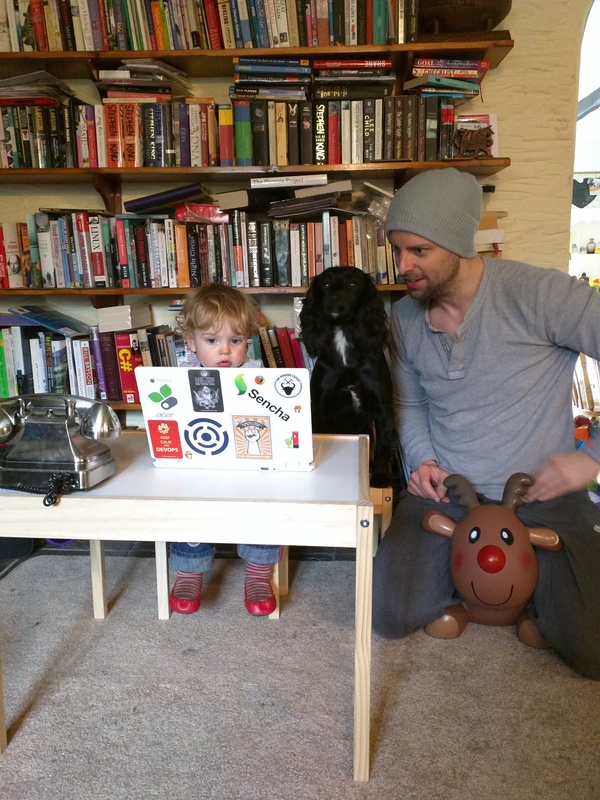 Here’s how it works: you take Danny the developer and put him in QA for a couple of sprints. Meanwhile, you take Tammy the Tester and put her in Dev for a couple of sprints. At a later date, Danny the dev will have to do a stint in the helpdesk, while Tammy does a couple of sprints working with the BA or Product Owner. Until eventually, everyone in your sprint team will have done stints in each of the following teams: Dev, Test, Helpdesk, Infrastructure/ops, Architecture, Product (Product Management, BA or whatever you have in your org), and possibly even Sales. It can take up to a year to complete the full set, but the amount you learn is invaluable. It’s not just skills that you pick up, but most of all it’s the different perspectives you get to see. Eventually, this experience will make you a better software delivery professional. Tech Academies are becoming quite popular, and we’re seeing an increasing demand for help in setting these up within organisations. The idea is to create a number of internal training courses, tailor-made for the challenges that are unique to your organisation. These could be anything from Agile Coaching courses to Database Administration courses (and everything in between). It’s even quite common to see organisation-specific “certification” as well. People can enrol in one of these academies by choice, or you can make them mandatory, it’s up to you – but the key thing is to make them specific to your organisation’s needs. I think these are exceedingly valuable, and they have the added advantage over external training courses of always being 100% relevant, plus you can also ensure that everyone is getting the same standard of training! Blogs are a great source of information, and a great way to keep up to date with fellow professionals in your technical area. But don’t just read them, write one for yourself! Keeping a team journal or a company blog is a great way of promoting the cool stuff you’re doing, and is also a great way to encourage and develop people’s technical writing skills (not to mention their written communication skills). Conferences are a great source of free T-shirts, pens, hats, stress-balls, stickers, key-rings, laser-pointers and other things that you quickly get bored of and leave on your desk at the office. But did you know that you can actually learn stuff at conferences as well? It’s true! Some conferences have really, really clever people speaking at them, (other conferences have me), and you’ll usually find the speakers are more than happy to have a chat with you over a drink after their talk. In all seriousness, the Pipeline conference this year was brilliant – a great crowd of very smart professionals from all walks of life, an inspiring keynote from Linda Rising, and a chilled atmosphere. So, get along to a conference (even if you have to take a devday to get away with it), write down what you learn, make a blog out of it, do a tech-talk to your team about it, expand that into a workshop, maybe include some pairing and/or mobbing, and then head on out to a meetup to chat to more like-minded professionals. 🙂 Learning Level: Einstein! The IT Ops team’s 4th sprint came to its conclusion recently… and we delivered all of our commitments! Huzzah! This post is basically a summary of how we analysed the sprint and what we got up to in the retrospective. In addition to these tasks there were a bunch of other smaller tasks, far too dull for me to list here. This was the first time we’d completed all of our committed points, and it gave us enough information to work out how many points we can realistically attempt to deliver in each sprint. Once again the team completed over 100 points in the sprint, and once again we committed to doing 50 project points (the other 50-or-so being unplanned interruptions). That’s very much in-line with the total we’ve come to expect. We averaged 3.8 points per person per day for the duration of the sprint. This means that we’re able to do roughly 2 points per person per day on committed project work. In an ideal scenario, with no interruptions, no meetings and nothing to distract us from our tasks, we estimate that we could do about 6 points per person per day. Therefore, statistically speaking, were actually 33% productive on our project work. 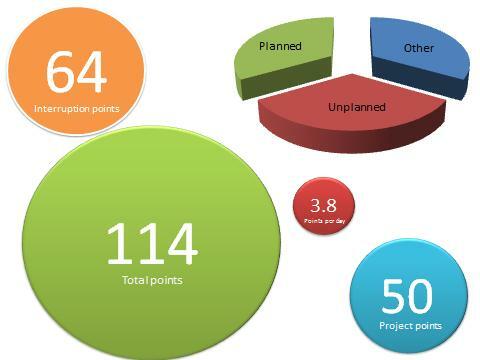 Of the remaining 67% we spent another 33% on interruptions. So what happens to the other 33%?? The remaining effort and time is taken up with meetings, discussions, unrecorded interruptions, emails, phone calls and unproductive time. This figure (33%) is in the region of what I expected before we embarked upon this process some 8 weeks ago. Well we know that we can complete approximately 50 project points per sprint. So we can now break down upcoming projects into tasks, and give realistic predictions on when they can be delivered. The only caveat is that we do not make guarantees on project priority. We will always commit to working on delivering the highest business value projects first, and as a result will take guidance from the business on priorities. If a project’s priority is lowered then it will likely drop down the pecking order of our tasks, and its delivery date will slip. In short, providing project priorities don’t chance for the duration of the project, we can now give far more realistic predictions on delivery dates. To get the creative juices flowing, we started the retrospective with everyone drawing a picture of Sprint 4. There were no rules to this task, we could draw anything we wanted that represented sprint 4 for us as individuals. 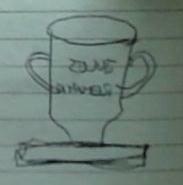 Farid, who for some reason I expected to be something of an artist, drew a picture of the Jules Rimet trophy. This was partly to represent the fact that we completed the Password and File server projects, and partly to reflect that we hit our target. 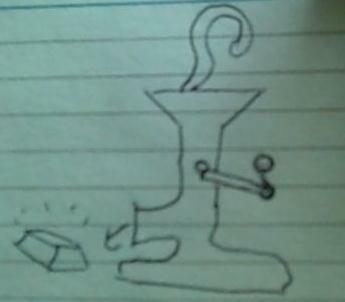 Nick’s “effort” was of a question mark going into a grinder with a gold bar coming out of the other end. This reflects the fact that we’re not 100% sure of what’s happening up front at the beginning of our sprint, and we base our estimations on “best-guesses”, but by the end of the sprint we were producing the goods. It also raises a very relevant point about how we know we are addressing the right projects/tasks in the right order. More on that later. Jon (in his unique avant-garde style) drew a person wearing a Boss hat. 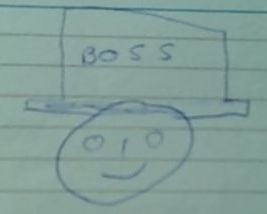 The person represents the team, and the boss hat is representative of the fact that we all completed our tasks on time and delivered what we committed to. Or at least that was his explanation, although I suspect it has more to do with the Lonely Island “Like a Boss” video, which is something of a theme tune in the IT Ops team. Seriously. Leo drew the burndown, the original of which you can find at the bottom of this post. 1. Using small post-it notes to record interruptions on the board didn’t work. They’re too small and not sticky enough. This was a major issue for Leo and Jon, who clearly have something against post-it notes. 2. We need to plan more carefully. Our planning sessions are rushed, and as a result we don’t think our tasks through as well as we should. The main failure here is that we don’t think about the impact other people can have on our tasks. Finally we discussed the stats and figures mentioned earlier, and then we looked back at the burndown to see if there was any useful information we could take from it. Leo suggested that the burndown be pre-populated with the mean line, so that we can see our daily deviation from that line. I have filed this suggestion in a folder named “Leo’s Good Ideas”, and we’ll adopt it in future sprints once I’ve worked out how to use Excel properly (or found a pen and a ruler). As mentioned earlier, we’ve worked out what our average velocity is – and we can now confidently say that 50 project points per sprint is a realistic target for the team. Now that we’ve established this, we need to turn our attention to ensuring that we’re delivering the highest business value we possibly can. At present we feel we are slightly deficient in engaging with the business to define our priorities, so in the future we’ll be looking at having a much closer engagement with the rest of the business to help us with our prioritising and acceptance criteria. We want to be delivering the most important projects first, and we want to have a clear picture of what a successful delivery of those projects looks like. Over the next couple of sprints we’ll be shifting our focus in this direction, and hopefully people will start to see the results over the next few weeks. P.S. Jon is available for hire as a short order artist, ideal for weddings and birthday parties. Disappointment guaranteed. Yes, those were the highlights. But don’t scoff – that new dev server was AMAZEBALLS. 2 week “focus” made a huge difference: we could concentrate on a smaller number of tasks, rather than work from a massive backlog with no end in sight. We under-estimated task sizes. Massively, in some cases. Time-boxing certain IT requests was a good idea. We didn’t take holidays into account when we did our sprint planning! Duuuuuh. We need to take holidays into account! 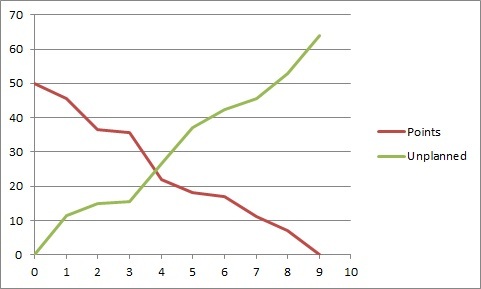 Friday to Tuesday were the least productive days in terms of project work. This was mainly due to hangovers holidays which “we” (namely me) hadn’t taken into account, with 2/3rds of the team being off at one point. Sprint 1 was an enjoyable success within the team. The increased visibility of interruptions as well as a clearer focus on our tasks was refreshing. We failed to deliver one project (the new file server), which is disappointing, and we will need to focus on progressing and completing our project tasks in future. We’ll continue with Scrum for the time being. The other thing we noticed was that interruptions take up more time than just the duration of the interruption. There’s an additional amount of time on top of each interruption which needs to be taken into account. When someone is being productive working on a project task which, let’s say will take 3 hours, and they get interrupted to do an IT request which may only take 1 hour, the total time for completing the project task PLUS the interruption isn’t going to be 4 hours. It’s more likely to be 5, and this is because it takes some time to get back to being fully productive. Today we started day 1 of our first ever ITOps sprint. This all came about because we needed a way of working out our productivity on “project tasks”, as well as learning how to triage our interruptions a bit better. None of the IT Ops team had tried any form of agile before, so there’s a mix of excitement and apprehension at the moment! I’ve opted for the old skool cards and sprint board (we’re using scrum by the way – more on this in a bit) rather than using an IT based system like Jira. This is mainly because everyone’s co-located, but also because I think it’s a good way to advertise what we’re doing within the office, and it’s an easy way to introduce a team to scrum. The team already had a backlog of projects, so it was quite an easy job to break these down into cards. First of all we prioritised the projects and then sized up a bunch of tasks. We’re guessing, for this first sprint, that we’ll probably be around 40% to 50% productive on these project tasks, while the rest of our time will be taken up by interruptions (IT requests, responding to inquiries, dealing with unexpected issues etc). 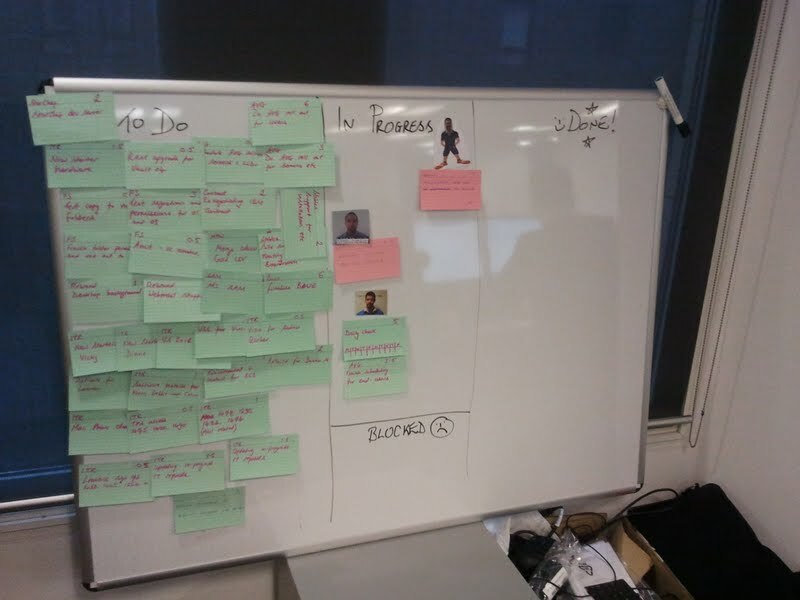 Sprint 1 – planned, or “committed” tasks are on green cards, while interruptions go on those lovely pinky-reddish ones. I’m using a points system which is roughly equivalent to 1 point = 1 hour’s effort. This is a bit more granular than you might expect in a dev sprint, but since we’re dealing with a very high number of smaller tasks, I’ve opted for this slightly more granular scale. As well as project work, there was also an existing list of IT requests which were in the queue waiting to be done. I wanted to “commit” to getting some of these done, so we planned them in to the sprint. I had originally thought of setting a goal of reducing the IT request queue by 30 tickets, and having that as a card, but I decided against this because I don’t feel it really represents a single task in it’s own right. I might change my mind about this at a later date though! So instead of doing that, we just chose the highest priority IT requests, and then arranged them by logical groupings (for instance, 3 IT requests to rebuild laptops would be grouped together). At the end of our planning session we had committed to achieving approximately 40% productivity. We expect at least 50% of our time to be taken up by interruptions – this is based on a best-guess estimate, and will be refined from one sprint to the next as we progress on our agile journey. Whenever we get an interruption, let’s say someone comes over and says his laptop is broken, or we get an email saying a printer has mysteriously stopped working, then we scribble down a very brief summary of this issue on a red/pink card and make a quick call on whether it’s a higher priority that our current “in progress” tasks. If it is, then it goes straight into “in progress”, and we might have to move something out of “in progress” if the interruption means we need to park it for a while. Otherwise, the interruption will go in the backlog or in the “to do” list, depending on urgency. At the end of the sprint we’re expecting to see a whole lot more red cards than green ones in the “Done” column. Indeed, we’re only a couple of hours into the first sprint an already the interruption cards contribute more than a 4:1 ratio in terms of hours actually worked today! Interruptions already outweigh “committed” tasks by 4:1 in terms of hours worked – looks like my 40% guess was a bit optimistic! One of the goals of this agile style of working is to get us to think a bit smarter when it comes to prioritising interruptions. It’s been felt in the past that interruptions always get given higher priority over our project work, when perhaps they shouldn’t have been. I suspect that in reality there’s a combination of reasons why the interruptions got done over project work: they’re usually smaller tasks, someone is usually telling you it’s urgent, it’s nice to help people out, and sometimes it’s not very easy to tell someone that you aren’t going to do their request because it’s not high enough priority. By writing the interruptions down on a card, and being able to look at the board and see a list of tasks we have committed to deliver, I’m hoping that we will be able to make better judgement calls on the priority, and also make it easier to show people that their requests are competing with a large number of other tasks which we’ve promised to get done. I don’t actually see this as the perfect solution by any means, and as you might be able to tell already, there’s a slight leaning towards Kanban. I eventually want to go full-kanban, so to speak, but I feel that our scrum based approach provides a much easier introduction to agile concepts. 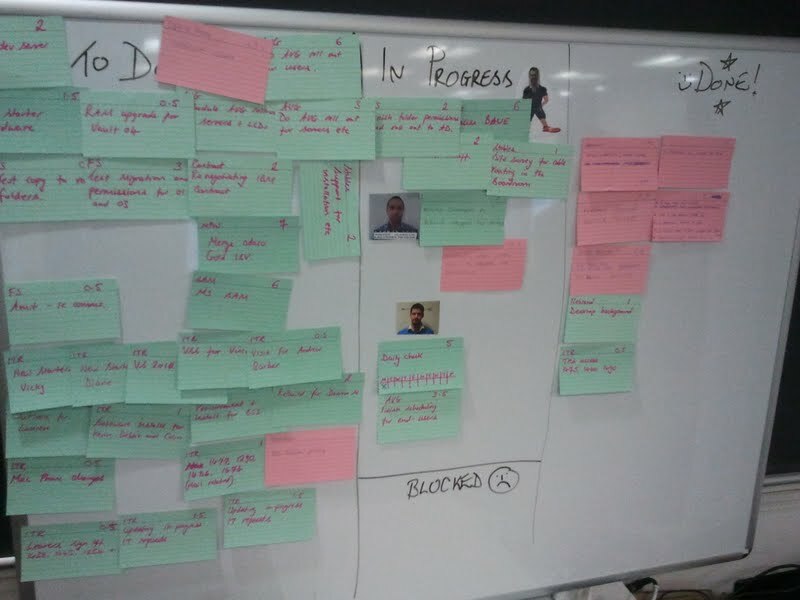 Kanban seems to be much more geared towards an Ops style environment, with it’s continuous additions of tasks to the backlog and its rolling process. I think the pull based system and the focus on “Work In Progress” will provide some good tools for the ITOps team to manage their work flow. For now though, they’re getting down with a bit of scrum to get used to the terms and the ideas, and to understand what the hell the devs are talking about! We’ll stick with scrum for a while and at the end of our sprint we’ll demo what project work we actually got through, as well as advertise the amount of IT requests we did, and the number of “interruptions” we successfully handled (although I don’t think I’ll keep calling them “interruptions” :-)). I’m also looking forward to our first retrospective, which we’ll be doing at the end of each sprint as a learning task – we want to see what we did well and what we did badly, as well as take a good look at our original estimations! I’ll keep track of our burndown, and as the weeks go by I’ll try to give the team as much supporting metrics/information as I can, such as the number of hours since an interruption, the number of project tasks that are stuck in “In Progress” etc. But most important of all, we’re looking at this as a learning experience, an opportunity for us to improve the way we manage projects and a chance for everyone to get better at prioritising and estimating. I’ll keep the posts coming whenever I get the chance!